Klein Marine Systems, Inc. was formed back in 1968 when Marty Klein, who many consider to be the father of side scan sonar, began building his own devices from his home in Lexington, Massachusetts. Over 50 years in business, Klein Marine Systems is headquartered in Salem, New Hampshire and is conveniently located approximately 30 miles Northwest of Boston, Massachusetts. Klein’s business is structured into two business segments. Klein Associates, Inc. a wholly owned subsidiary of Mitcham Industries, Inc. became the first commercial manufacturer of side scan sonar in the world. Since then, Klein Marine Systems has become the world’s leading sensor technology provider that manufactures and designs high-resolution side scan and multi-beam sonar equipment, and radar-based security and surveillance systems. Our side scan sonar systems are respected as the standard of excellence in the industry and are deployed by Governments, Navies, Port Authorities, surveyors, oil companies and universities worldwide. 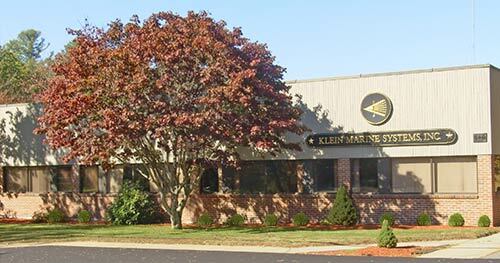 Klein Marine Systems has developed a worldwide reputation of excellence in the industry by providing quality products and excellent customer service. While our products are among the most reliable in the industry, there are times when service or technical advice is required after normal business hours. Throughout the world, Klein’s Side Scan Sonar, and HarborGuard® Maritime Security and Surveillance systems are in use daily. Klein’s service technicians for Side Scan Sonar systems, Bathymetric systems and all related products can normally diagnose problems with a simple telephone call. If you need help, call us anytime. Klein Marine Systems strives to provide the highest quality products and service to a wide range of Military and Commercial markets. Klein Marine Systems, Inc. is a proud USA manufacturer and supplier of maritime security equipment and solutions. With an extensive line of single-beam and multi-beam side-scan sonar systems, Klein can provide port security and law enforcement agencies with important tools for underwater search and survey operations in support of IED detection and mitigation. Side-scan sonar systems provide real-time, high resolution imagery for effect scanning of channels, piers, berths and ship’s hulls. Klein’s HarborGuard-Pro Integrated Waterside Security System is a radar and camera based security system providing continuous, all-weather, day-night surveillance of the unattended waterfront approaches to port facilities and critical infrastructure. HarborGuard-Pro offers enhanced maritime domain awareness to local and regional port security stakeholders. Klein Marine products are covered under the Authorized Equipment List (AEL) and purchase of these systems may be allowable by certain DHS Security Grant Programs. Contact Klein Marine Systems for more information.